Our church is hosting a backpack drive. It is something we do every year. Last year my husband packed a backpack for a middle/high school student. This year I was really excited to get my niece involved. So Saturday morning, while on our yearly trip to Big Canoe, Ga. we packed up and after making a quick stop for some produce at the local farmers market, we pulled into the Dollar General. I let Makaylin know that this was a special day, that we weren't shopping for her, but for another child. She was curious and so we talked about why. We talked about how when kids start kindergarten, like she will in a year, the school asks for them to have a backpack and all kinds of school supplies. We discussed how school supplies cost money and how sometimes there are kids whose families have a hard time affording those supplies. I may be biased, but she's a pretty bright little 4 year old and this seemed to make sense to her. We rolled into the store and I will be honest, I was nervous. Dollar General is a kids dream! There was so much for her to see, so much for her to say, "I want that." But we headed straight for the school supplies and got cracking. The first thing she saw was a Frozen backpack and next thing I know she was fast at work. Her own little personal mission to make another little girls day a happy one. It was so neat to see her smile and see her little brain work through what she wanted to get. Everything she picked she picked with love. "Oh she will love this Aunt Mel!!" "Oh this is the best! Here let me put it in the cart." "The flower folders are so beautiful (giving them a hug). She will think they're perfect (putting them in the cart)." If Uncle Andrew accidentally slipped something in the cart, he would get a "remember Uncle Andrew give it to me first." This was big business she was attending to and she had to make sure every item passed her little hand inspection. One I am so glad we got to do together. But, it was what came after that made this story not only so much more than a backpack for the general experience, but also so much more than a backpack for our car ride back to the cabin. You see, as we were checking out, Makaylin was telling the lady that the backpack wasn't for her but another little girl. The lady, being sweet and trying to encourage her, said, "your mommy and daddy must be so proud of you." We get this often, people thinking that she (or my other niece and nephew or the kids I nanny for) is our child. It just happens. Most of the time she just says, "that's my Aunt Mel." But this was different. On this day she chose to say, "My daddy is in heaven." Now this was probably because we had already been talking about him on the way to the farmers market. She heard his name in a song Babe and I were discussing and said, "don't talk about my daddy." I let her know it was someone else named John, but that she could talk about her daddy whenever she wanted to. And from there the questions came... "Why does he have to stay in heaven? Does God love daddy more than me and that's why he had to go to heaven? When can I go to heaven? I want my daddy to come down." It's those questions that wrench at the heart, but it's also those questions and more importantly the answers to them that set us all free... "He stays there because God made heaven so wonderful that we want to stay with Him, but daddy's always watching over you. No, baby, God's heart is so big he loves everyone equally, no matter what we do, God's love is big enough to love all His people. It's not time for you to go to Heaven now, God wants you here with us, we live life here on Earth for a while to learn to love well and to teach other people about Jesus. And I want to see your daddy too sweet girl, but someday we will get to see him again and all be together in Heaven forever, that's how Heaven works we get to live with God and Jesus in a real, never die, forever." She had changed the subject after that. Quickly switching from the deep questions of life to thoughts on pool swimming and rock sliding as only kids can. So it was there on the surface when that sweet lady mentioned her daddy. You could see the look on the woman's face, but we assured her that yes, we are a very proud aunt and uncle, that Makaylin's parents were proud of her, thanked her and walked out. And then it opened sweet conversation about what her attitude that day revealed. We told Makaylin that we were so proud of her. We asked her who else would be proud of how happy she was to be giving to someone else. She replied, "My mommy." And we asked who else, "My daddy!" To which we replied, "Yes, baby, even in Heaven your daddy can still be so proud of you." And we asked who else, "God!!" "Yes, big girl, God is so proud of you. Did you know that what you did today helped you have a heart like Jesus. You gave to someone else without thinking of yourself. You loved and cared for someone who needed help and that's how Jesus loves us. And God is very proud of you!" God is proud of her and I am proud of her. I am thankful for her sweet heart. I am thankful for the chance to have heart talks about her daddy. I hope it helped her heart, but I know it helped mine. I am thankful for backpacks for a sweet little girl somewhere in Orlando. 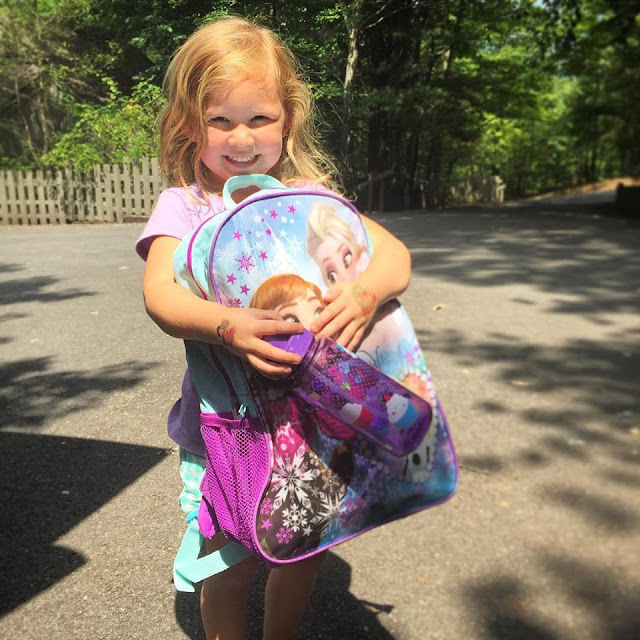 And I am thankful that a Frozen backpack has the ability to be so much more than a backpack. Thank you! It was a sweet time for us for sure and she loved every minute! Thanks for stopping by :) Have a wonderful evening!